The course was designed by Jack Neville and Douglas Grant and opened on February 22, 1919. Neville also designed the back nine at Pacific Grove Municipal Golf Course on the other side of the Monterey Peninsula. His objective was to place as many of the holes as possible along the rocky and beautiful Monterey coast line. This was accomplished using a "figure 8" layout. On February 27, 1919, Samuel Finley Brown Morse formed the Del Monte Properties Company, and acquired the extensive holdings of the Pacific Improvement Company, which included the Del Monte Forest, the Del Monte Lodge and the Hotel Del Monte. (After World War II, the Hotel del Monte building and surrounding grounds were acquired by the United States Navy to its Naval Postgraduate School and the building was renamed Herrmann Hall.) Golf Course Histories has an aerial comparison of the changes to the course, notably the 17th hole, from 1938 to 2014. The course was bought by a consortium of Japanese investors during the upswing of foreign investments in American properties in the early 1990s. The sale, however, generated controversy when it was discovered that one of the investors had alleged ties to organized crime in Japan. It was then bought by another group of Japanese investors before being sold to the Pebble Beach Co. several years later. The first professional tournament at Pebble Beach was the Monterey Peninsula Open in 1926, which had a $5,000 purse. Harry "Lighthorse" Cooper of Texas won with a 72-hole score of 293 (+5). In 1929, Pebble hosted its first major - the U.S. Amateur. A match play event, it was won by Jimmy Johnston of Minnesota, while Bobby Jones tied for medalist honors in the stroke play qualifier. In 1947, Pebble Beach began its run as one of the host courses for the Bing Crosby National Pro-Am tournament, sometimes known as the "Clam Bake", and now the AT&T Pebble Beach Pro-Am. The tournament held annually, usually in February, and is an unusual four-round tournament. The final round on Sunday is played at Pebble Beach, but the first three rounds of pro-am play are contested in round-robin format at Pebble Beach and two other courses: currently Spyglass Hill Golf Course and Monterey Peninsula Country Club, Shores Course. In August or September, the course also hosts the Champions Tour First Tee Open with the Poppy Hills Golf Course. Pebble Beach has hosted the U.S. Open five times, first in 1972, and most recently in 2010. It has an exceptionally distinguished set of champions including Jack Nicklaus, Tom Watson, Tom Kite, Tiger Woods, and Graeme McDowell. The championship is scheduled to return in 2019, as a celebration of the course's centennial. Pebble Beach was also the site of the PGA Championship in 1977, won by Lanny Wadkins in a sudden-death playoff over Gene Littler, the first use of the format in a major championship. Many other high-profile championships have been staged on the course including several U.S. Amateur Championships; Nicklaus won his second title in the event here in 1961. Eleven years later in 1972, he won Pebble Beach's first U.S. Open. The short par 3 7th, which plays to just over 100 yards even during major championships, is one of the most photographed holes in the world. From an elevated tee, players hit straight out toward the Pacific Ocean, with nothing in the background but the often violent Pacific Ocean surf crashing against rocky outcroppings. The long par 4 8th runs alongside the 6th hole leaving the peninsula and heading back toward the coastline. A dogleg right, the ocean is a constant companion along the entire right side of the hole. The landing area is extremely generous in width, but a long straight drive could leave the fairway and enter an inlet of the sea. Because the landing area is elevated on a cliff above the green, players have a good view of the small landing target a mid to long iron away. Jack Nicklaus has called this his favorite approach shot in all of golf. The par 3 17th is situated on a smaller peninsula to the west of the one that holds the 6-8th holes. Although there is an ocean view and the sea runs along the left side, the primary challenge of the 17th is its length (playing 180-210 yards during championships) and its unusual shaped green. The green is long and thin, tilted about 45 degrees from the angle of the golfer on the tee. Depending upon pin position and wind, a golfer may use a great variety of clubs for the tee shot and, although the green is large in area, the landing area for any approach is relatively small. A large sand trap guards the front and left. In addition to the lengthening of the 18th, the other most significant change in the course's layout came in 1998. Early in the course's history, a parcel of land along the ocean was sold off, forcing the 5th to run inland to where the tee of 6 now stands. As early as a year after that parcel was sold, the course tried to buy back the land but was unsuccessful until 1995. Jack Nicklaus designed a new par 3 on that land. Although it forces a long walk from the 5th green to the 6th tee, the course finally uses as much ocean real estate as possible, which was Neville's original vision. Recent changes done in 2008 were to holes 3, 6, 9, 10, and 12, which changed the dynamics of play with new bunkers located on each fairway. These additions were integrated for the 2010 U.S. Open, which also modified the 2nd hole to a par 4, which reduced the course to a par 71 for the championship, which was lengthened to 7040 yards (6437 m). Pebble Beach has hosted the U.S. Open five times: 1972, 1982, 1992, 2000, and 2010. It is scheduled to host a sixth time in 2019, the centennial of the course, and a seventh time in 2027. The U.S. Open was first held at Pebble Beach in 1972, won by Jack Nicklaus, who captured his 11th major title (of an eventual 18) as a professional. It was a historically important win, as Nicklaus tied Bobby Jones with 13 major titles; a lifelong amateur, Jones' major titles were in the U.S. Open, British Open, U.S. Amateur, and British Amateur. Nicklaus won the U.S. Amateur twice, in 1959 (Broadmoor, Colorado) and 1961 (Pebble Beach). Nicklaus secured the victory in 1972 with one of the most famous golf shots of all time. He arrived at the 17th tee facing deteriorating weather and a brisk wind on the challenging par-3 hole. Nicklaus hit a 1-iron that bounced once and struck the flagstick; it came to rest next to the cup for a tap-in birdie. Two months earlier, Nicklaus had won the Masters to become the first in a dozen years (Arnold Palmer in 1960) to win golf's first two major titles of the season. At the British Open in July, Nicklaus shot a final round 66 to finish second, one stroke behind Lee Trevino, ending his Grand Slam run in 1972. (Palmer also missed a third straight major by a stroke at the 1960 British Open.) Through 2017, only one golfer has won the Masters, U.S. Open, and British Open in the same calendar year: Ben Hogan in 1953. Nicklaus also won the Crosby events on either side of this Open, in 1972 and 1973, and previously in 1967. Nicklaus was also a key player in 1982 at Pebble Beach. On the front nine on Sunday, Nicklaus made five straight birdies on holes 3 thru 7 and finished ahead of the last group tied for the lead. As was the case in 1972, the 17th hole was again the site of one golf's most memorable shots. In the last group, future Hall Of Famer Tom Watson hit his tee shot on the par-3 17th just a few feet off the green, into heavy rough which had been grown very tall and thick, typical of USGA Open playing conditions. His succeeding pitch was from above the hole; he needed to strike the ball firmly to get the ball out of the rough, but such an aggressive attack would likely leave a long comeback putt to save par. In a live television interview immediately after Watson's errant tee shot, and given the difficulty of Watson's upcoming pitch shot Nicklaus appeared confident that he would soon be in the outright lead. Watson was apparently equally confident. He and his caddy Bruce Edwards strategized on the shot, and Edwards encouraged him to get the ball close. Watson replied, "Close, hell, I'm going to sink it." The pitch came out perfectly, landed softly and rolled into the cup. Watson ran onto the green jubilantly and gestured back at Edwards saying "I told you so". He then birdied the challenging par-5 18th hole for a two-shot victory margin in his only U.S. Open win. Watson had previously won twice at Pebble Beach, in the Crosby events of 1977 and 1978. During the following winter, a storm eroded portions of the 17th green and 18th tee box into the Pacific Ocean. Though rebuilt, the exact spot where Watson struck his historic chip shot no longer exists. The 1992 championship was one of the most difficult ever played at Pebble Beach, with clear skies and brisk winds on the weekend. Only two players finished under par: champion Tom Kite at 285 (-3) and runner-up Jeff Sluman at 287 (-1). Gil Morgan was 12 under par early in the third round, but later fell back. Kite was one of the best players on tour in the 1980s, with 19 top tens in majors prior to 1992. Perhaps the best player of his era without a major, he finally won at Pebble Beach at age 42. This championship was also notable as the last par-72 course in the U.S. Open, with no converted par 5's, until 2017, when Erin Hills, which was built in 1998, played as a par-72. Perhaps looking for a special place to host in 2000, the USGA decided that Pebble Beach should host the first U.S. Open of the millennium. In some respects the Open was even tougher than the 1992 contest, with only one player finishing under par - champion Tiger Woods. Woods scored 65-69-71-67 to tie a U.S. Open record with 272, and set a U.S. Open record by finishing 12 under par, 15 shots ahead of the runners-up, the largest margin of victory ever in a major championship. The third major of Woods' career, it was the start of his non-calendar year Grand Slam; he won the following three majors for four in a row. Graeme McDowell won in 2010 by one stroke over Grégory Havret. Ernie Els finished third, with Woods and Phil Mickelson in a tie for fourth. McDowell, from Northern Ireland, became the first European to win the U.S. Open in forty years. In his last U.S. Open, 1982 champion Watson at age 60 became the second-oldest player to make a U.S. Open cut (after Sam Snead, age 61 in 1973), and finished tied for 29th. There has been continuing controversy between recreational interests and environmental protection, related to a proposed new golf course development by the Pebble Beach Company. The new golf course proposal has existed in some form since the early 1990s, while the environmental protection issues center on the potential damage to rare and endangered species in this locale. To receive advance tee times at Pebble Beach, it is necessary to stay at least two nights at the Lodge at Pebble Beach or the Inn at Spanish Bay (properties of the Pebble Beach Company) or procure a package through travel agents specializing in the area. ^ a b "Yardages and ratings". Pebble Beach Golf Links. Retrieved June 9, 2012. ^ a b "Course Rating and Slope Database™: Pebble Beach GL". USGA. Retrieved June 9, 2012. ^ "National Geographic's Top Ten Golf Courses". The 10 Best of Everything. Retrieved 2010-11-06. ^ a b Hathaway, Pat. "Hotel Del Monte, Monterey". California Views: The Pat Hathaway Photo Collection. Retrieved 22 June 2013. ^ "Pebble Beach Golf Links". MontereyPeninsulaGolf.com. 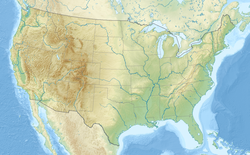 ^ "2010 U.S. Open: Course". Majors Championships (PGA & PGA Tour). Retrieved June 9, 2012. ^ "Virtual Golf Course: The Extraordinary Views at Pebble Beach". trugolf.com. Retrieved October 27, 2017. 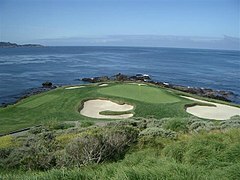 ^ a b "Pebble Beach to host Women's U.S. Open in 2023". ESPN. Associated Press. October 24, 2017. ^ Watson, Tom; Tatum, Sandy; Davis, Martin (1997). The 25 Greatest Achievements in Golf: The Best of the Best. Triumph Books. ISBN 1572432470. ^ Whitten, Ron (May 25, 2010). "What You Might Not Know About Pebble Beach". Golf Digest. Retrieved February 8, 2011. ^ "Pebble Beach golf course vs. Monterey pines: Pebble Beach course proposal goes before Coastal Commission". Orange County Register. Associated Press. June 13, 2007. Archived from the original on July 16, 2007. 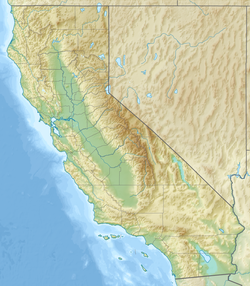 Wikimedia Commons has media related to Pebble Beach Golf Links. Monterey Peninsula Golf: Pebble Beach Golf Links - course information, photos, and interactive map.